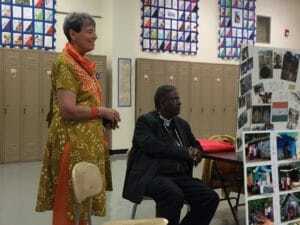 Bishop Sebastian Thekethecherial from Kerala, India, visited students at St. Joseph Catholic School on Sept. 27. For the past few years, fifth- and sixth-graders at the school have sponsored a family from India through the WE SHARE program run by Dave and Kathy Rennie from Bloomington. Kathy Rennie is originally from St. Joseph. This year, the family sponsored by fifth-graders has five members including a father who works as a coolie (does day labor work), a mother who has some significant health issues and three daughters, one of which has a heart condition. Twenty-two fifth-graders donated $225 to the family. The family sponsored by sixth-graders has four members including a father, mother and two sons. Ten sixth-graders donated $100 to sponsor the family. During the school year, the students write letters to the adopted family and receive letters back. Fifth-grade teacher Tess Koltes said through this sponsorship, students are living their Catholic Social Teaching of feeding the hungry, giving drink to the thirsty, clothing the naked and sheltering the homeless. During his visit, Thekethecherial spoke about finding joy. Thekethecherial, who is from the Diocese of Vijayapuram, spoke about an unusually high amount of rainfall during the monsoon season that caused extreme flooding in the state of Kerala, which is known as the land of coconuts. Because of this, many people have lost their homes and are in need of basic necessities of food, clothing and shelter. Kathy Rennie’s mother sponsored Thekethecherial as he was going through the seminary to be a priest. Rennie and Thekethecherial consider each other spiritual brother and sister. The Rennies and Thekethecherial thanked Koltes, sixth-grade teacher, Susan Huls, and their students for the visit. The WE SHARE program was started in 1994 to help the Vijayapuram Diocese which is the poorest Catholic Diocese in Kerala, India. In India, law denies government benefits to Christians who are poor, and they don’t have welfare or food shelves. People who practice Christianity are dependent on the Church when they become desperate. The government will provide benefits to poor people who practice Hinduism. If Christians become too desperate and cannot survive on the finances they have, it is often a temptation for them to revert back to Hinduism. Many poor people cannot afford medical insurance and must pay their medical expenses. People often cannot work because of high unemployment, sickness or the monsoon season. The monsoon season which normally lasts from June through August destroys poorly built huts and homes and reduces food supplies. It can also be costly for children who are poor to attend school because they must pay for their books, uniforms and other fees. Various ways people can help include sponsoring a family, building a house, sponsoring a seminarian, or supporting the Vijayapuram Diocese. For additional information about the program, visit the WE SHARE website at http://weshareprogram.net. Kathy Rennie (left) and Bishop Sebastian Thekethecherial from Kerala, India, visit students at St. Joseph Catholic School Sept. 27. Fifth- and sixth-graders at the school have sponsored a family from India, for the past few years through the WE SHARE program run by Dave and Kathy Rennie from Bloomington. Kathy Rennie is originally from St. Joseph. 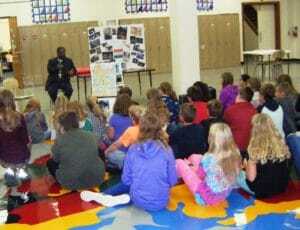 St. Joseph Catholic School students listen Sept. 27 to Bishop Sebastian Thekethecherial from Kerala, India.